The Julius Caeser line by Diamond Crown honors the late JC Newman as well as commemorates the company's 115th Anniversary. 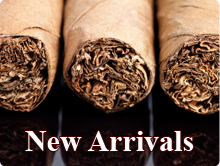 These cigars are filled with tobacco from central America and the carribbean basin, binded with a Dominican leaf and wrapped with an Ecuadorian grown Havana seed tobacco. These tobaccos are aged for 5 years and give off a combination of rich coffee, sweetness and spice.